The Aryans who gave Persia its historical name, Airyana, the country of the Aryans, Iran, were, in Persia as in India, immigrants; but whereas in India the pre-Aryan populations have continued in existence, in Persia they seem to have been obliterated, so that nothing is known about them save that which can be deduced from material recovered on the lowest levels of the excavations at Susa, Damghan, Astara bad, Nihavand, Siyalk, and Persepolis. The earliest of these remains, chiefl y interesting pottery, can be attributed to the first half of the fourth millennium, but they bear witness to a culture already well evolved, so that the pre history of Iran must go back to an exceedingly early period. There seems, moreover, to have been in pre-Aryan Persia a remarkable continuity of development which is seen even down to the Bronze Age. The painted pottery found in all these places and also in various excavations in Mesopotamia shows that there were interrelations among the earliest cultures through out this region, and some connexion between western Iran and Elam, on the one hand, and Sumerian Mesopotamia on the other, is evident also at the beginning of the historical period, notably in the stone reliefs of Kurangun in Fars, and of Sarpul i-Zohab near Qasr-i-Shirin, which apparently belong to the third millennium BC. The Kurangun relief of a king and his court rendering homage to a pair of seated gods is quite Sumerian in style. Similar evidence appears even well into the historical period. 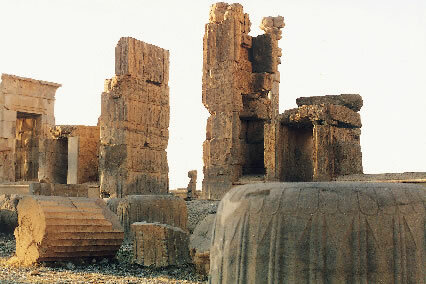 A rock sculpture and a number of bricks with Elamite cuneiform inscriptions have been found near Persepolis, which seem to indicate that Fars in the second millennium was part of the Elamite cultural zone. A curious collection of objects, largely in precious metal, discovered in Astarabad in 1835 included some pieces, especially a gold cup, which also seem to show Sumerian similarities, suggesting a relation between that district and Sumer. This archaeological evidence might be carried into the ethnographical and linguistic fi elds to support a theory of some Greater Susa or Greater Sumeria, but at the present stage of our knowledge this would be hazardous. Until we have further data we can only say that there was a long series of prehistoric cultures from Mesopotamia to India, which, in spite of undeniable local differences, show, at least as far as painted pottery is concerned, a common basic character. Possibly these civilizations were all the creation of a Caucasian race whose original centre was in the Zagros Mountains. But, however that may be, it is clear that, as far as we now know, in the painted pottery, which is almost our only record of these ancient cultures, Iran not only plays the role of the central agent but has also chronological priority. At an undetermined date, which can be placed very hypothetically at about the middle of the second millennium BC, Iran was occupied by an Indo-European people, the Indo- Iranians, who called themselves Aryans. There must have been a long period during which the people who became the Iranians and those who became the Indians led a common life, for there are very close similarities between the oldest recorded Indo-Iranian language, Avestic, more particularly Gathic, and Old Persian, on the one hand, and Sanskrit on the other. 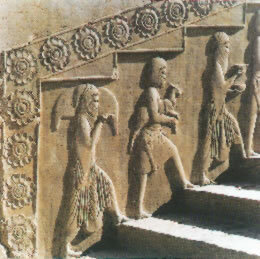 The question of the origins of the Indo- Iranians is connected with the larger question of the origins of the Indo-Europeans. There are three theories that they originated in the German- Polish plain, and in that case the Indo-Iranians moved down by the Bosphoros and Asia Minor; that they had lived on the Russian steppes, and then the Indo-Iranians would have come through the Caucasus; or that their fi rst home was somewhere in the vicinity of Turkistan, and then they would have migrated through Transoxiana and Bactria. The first historical reference to the Indo-Iranians is in the fourteenth century BC. A Hittite inscription at Boghaz-Koy, which can be dated between 1377 and 1361 BC, states that a people established on the Upper Euphrates in northwestern Mesopotamia, the Mitanni, worshipped Indo-Iranian gods: Mithra, Varuna, Indra, and the Nasatya. Moreover, the Mitannu rulers, who had political and marital relations with the Egyptian Pharaohs of the Eighteenth Dynasty at the end of the fi fteenth and the fi rst half of the fourteenth century BC, had Iranian names. If the Mitanni were not themselves Iranian, they must have been organized by a conquering Indo-Iranian aristocracy. This is apparently true also of the Kassites or mountain people of Zagros who became masters of Babylon from 1749 to 1171 BC, for some of their dynastic names in the fourteenth and thirteenth centuries contain the names of Indo-Iranian gods, such as Surya and the Marut. Meanwhile, on the plains of Elam a series of kingdoms was suffering various vicissi tudes, though apparently a continuous culture was maintained. The people of the fourth millennium, judging from their pottery, practised a Fertility and Sun cult with astrological features and symbols that included a serpent, and worshipped a goddess whose history can be traced for centuries. Pro bably before the end of the fourth millennium, but certainly early in the third, there were also a personifi cation of the moon and a sun hero or god, who controlled serpents and such related creatures as the scorpion. 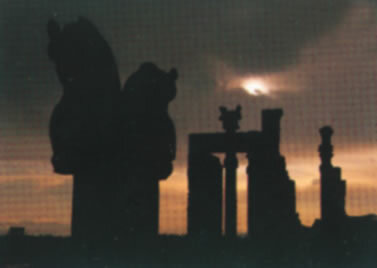 These cult elements are important, fi rstly be cause they establish links between the fourth and early third millennium culture in Elam and that on the plateau; and secondly, because their repeated recurrence in subsequent centuries shows that there was at least some degree of continuity in the successive cultures. Thus while the name of the goddess changes and rivals come to join the pantheon, the original conception apparently persists; the history of the moon divinity and his symbols is less ambiguous; and in the Kurangun relief the god sits on a snake throne, while the story of the Snake-Conqueror, together with a parallel Sun and Fertility cult, is recorded in the Avesta and the Bundahish. It is note worthy that in Iranian legendary history this Snake-Conqueror, Gayumarth, becomes the original King of Iran and is credited with founding the fi rst city at Istakhr, where, by a striking coincidence, the earliest known prehistoric settlement on the plateau has been discovered. Indirect references to the Elamite highlands during this period suggest that a power was in control there which was mightier than the government of Sumer, but the fi rst specifi c historical information comes with the conquest of Elam by Sargon the Great. Thereafter the region was dominated most of the time by Mesopotamian rulers, followed by the Kassites who had overrun Mesopotamia, until Kutir-Nahhunte of Elam in 1171 BC put an end to the Kassite control and established a true Elamite Empire. The tables were now turned and Elam dominated Mesopotamia. The greatest ruler of this line, Shilhak-Inshushinak, made wide conquests and liberally em ployed the vast wealth that accrued as a result for great temple buildings at Susa. But Elam's dominance was short-lived, succumbing to Nebuchadrezar (1146-1123 BC). After this conquest there is a long silence, but when we next hear of Elam, in the eighth century BC, there is again a kingdom there. In the seventh century, however, this was once more, and fi nally, eclipsed by the Mesopotamian powers. Throughout its long history the great monuments of Elam were built of bricks, and chiefl y of unfi red bricks. Fired bricks, when used at all, were limited to revetments, while by the twelfth century BC, at least, glazed bricks not infrequently served the same purpose, and these were already assembled into decorative and even fi gural designs. Stone appears only occasionally in reliefs, and we hear of special efforts being made to get rare woods from foreign countries. But perhaps the most ostentatious decoration consisted of metal plaques with repousse ornament. Almost nothing can be said of the plan or structure of the earliest buildings, save that a simple domical vaulting was developed very soon, but the records of the great temples of Shilhak- Inshushinak in the twelfth century are quite complete. Huge platforms were constructed as the foundation for important buildings. The main temple, which took characteristically, the form of an oblong rectangle, had within it a sanctuary which was either similar in proportions or might be square, and in the large temples there were various surrounding rooms. Some of the temples were two or three stories high. The wooden roof was carried on brick columns. The temple precincts were walled, with great metal doors, and sometimes, at least, were guarded by large lions modelled in the full round. Probably about the beginning of the first millennium another kingdom was evolving near Lake Urmiya, the Kingdom of Man. The towns in this district were heavily fortifi ed with double and even triple battlemented walls, very thick, provided with loopholes and reinforced with close-set towers, apparently round. The buildings might be as much as three stories high and were chiefl y of wood. Large wooden columns carried a fl at roof, though one temple in this region is shown as gabled. This highly evolved culture was supplanted by, and probably contributed to, that of the Medes. 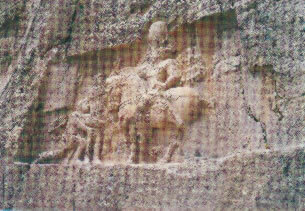 Contemporary with this Kingdom of Man was the rather better known Kingdom of Urartu in what is today Armenia. Local conditions permitted the development there of a masonry architecture for fortifi cations, foundations, and other heavy structures, though here, too, wood was an important building material. 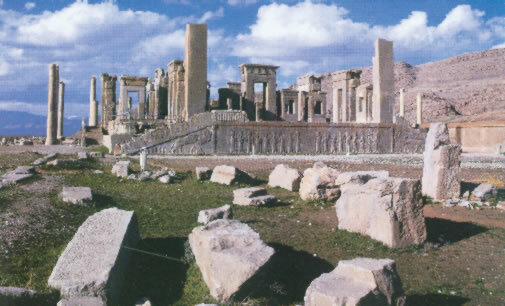 Both stone and metal revetments were used, and the striking contrast of black and white marble was exploited in the former, anticipating a feature of the royal Achaemenid buildings at Persepolis and other sites. The Mitanni and Kassites constituted only the advanceguard or possibly the rearguard of the Aryan migration. The bulk of the Iranian people settled on the plateau which still bears their name, while some lagged behind in the southern steppes. In the historical period they were distributed roughly in the following manner: the Medians (Mada), were inhabiting the country which is now Iraq-i-ajam; the Persians (Parsa) were in the country always called by them Fars (Pahlavi: Pars); the Parthians (Parthava, later Pahlava) were on the borders of the present Mazandaran and Khurasan; the Bac trians, in the Classical Bactria (Old Persian: Bakhtri; Avestic: Bakhdhi); the Soghdians (Sughda), in Transoxiana; the Sacians (Saka), in Farghana and in Kashghar; and fi nally the Scythians (Ashkuza in the cuneiform texts), in about the eighth century BC emigrated from Turkistan into southern Russia, a migration which was repeated in the third century BC by their brothers, the Sarmathians. The fi rst Iranian people to achieve political organization was the Medes. For a long time they were scattered in dispersed towns, in autonomous clans, and had as a result to submit to the sovereignty of the Assyrian Empire. Almost every Assyrian king from the end of the ninth century BC to about the middle of the seventh boasts of a military expedition in which he forced the 'Mada' to pay tribute. A little later, however, Media was shaken by the infl ux of a new Iranian migration. The Scythians, Iranians who had remained as nomads on the steppes of Russia and Turkistan, crossed the Caucasus, penetrated the Armenian region, and attacked the Assyrian Empire from the northeast. Contact with these other Iranians seems to have reawakened in the Medes their instinct for independence, for about the middle of the seventh century the two peoples together made war against the common enemy. Reinforced by the Babylonians, likewise enemies of the Assyrians, the Medians in 612 BC under the leadership of the king, Cyaxares (625-585 BC), took possession of Nineveh and completely destroyed it. Cyaxares' son and successor, Astyages, after a long reign (585-550 BC) given over to competing in luxury with the old Assyrian kings and to making his capital, Ecbatana, into a fi tting, successor of the destroyed Nineveh, was dethroned by Cyrus, and the Medes had to relinquish the dominance of the Iranian peoples and of the Eastern Empire to another great Iranian people, the Persians. Meanwhile, other large groups of Iranians - Scythians, Sarmathians, and Sacians - remained in Central Asia building up a life of their own, creating a cultural Outer Iran, which seems in time to have extended well up into Siberia, though the permanent focus was in southern Russia. Outer Iran created an animal art primarily in metalwork, the style of which, while intensely characteristic, shows certain kinship with the equally distinctive art of Luristan. Probably the two styles represent two phases of what was fundamentally one culture, which may have had its focus in the Caucasus. The Persians who supplanted the Medes were racially their brothers. They lived in what is today Fars and shortly after the middle of the seventh century BC had become vassals of Media. When the old kingdom of Elam was destroyed and depopulated by the Assyrians (646 BC) one clan of these Persians, the Achaemenids (Hakhamanishiya), had taken advantage of the situation to invade Elam and establish themselves there. Thus the Achaemenid chiefs became, in a way, 'Kings of Anzan', that is to say of Elam, without, however, ceasing to be regarded as vassals of the Median sovereigns to whom they were tied by family bonds. In the middle of the sixth century BC the king of Anzan was the Achaemenid, Cyrus (Kurush), the grandson, through his mother, of the Median king Astyages. Cyrus revolted against his grandfather, dethroned him, substituted the Persians for the Medians as leaders of the Iranian peoples and of the Eastern Empire (550-549 BC), and took the title 'King of Persia'. The change was in reality only one of emphasis in the pan-Iranian unity which had been created by the Medes: the Medio -Persian Empire became the Perso-Median Empire and the impetus of the Aryans to wards the conquest of the old world was resumed with renewed vigour. The first expedition of the Achaemenid hero was against Lydia, a wealthy kingdom which included all of western Asia Minor. In about 546 BC he took possession of Sardes, the capital of this country, and captured with it the Lydian king Croesus. From that time on, all of Asia Minor belonged to the Persian Empire, including the Greek colonies on the Aegean coast, an accession of territory which was later to give rise to the Graeco-Persian Wars. In the next six years (545-539 BC) Cyrus conquered eastern Iran, perhaps his most important achievement, because it established frontiers for Persia which survived all the later catastrophes. Cyrus crowned his life work by taking possession in 539 BC of Babylon, thereby gaining all the provinces of the Chaldaean Empire. This series of victories makes Cyrus one of the greatest conquerors in history. More over, his military ability was matched by a consummate political genius. His conquests, methodically prepared, were executed with a profound understanding of men. Further more, in contrast to other ancient Oriental conquerors, he was always humane. When he captured Astyages and Croesus, he not only spared their lives, but actually allotted to each a royal train. When he conquered Babylon, instead of destroying the city, he won over the population with his mercy, and even went through the ceremony of investiture as king of Babylon by the god Bel, according to the local rites. Finding in Babylonia Jews who had been deported by Nebuchadnezar, he set them free and re-established them in their homeland. 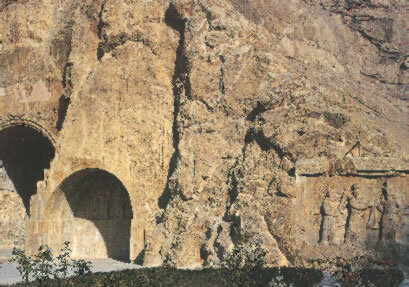 Cyrus died in 529 BC during a campaign against the East Iranian nomads. His son, Cambyses (Kambujiya, 529- 521 BC), showed the same broad minded tolerance which had distinguished his father. When he conquered Egypt, he repaired the great temple of Neith which had been damaged by his soldiers, and had himself instructed in the mysteries of Isis. Shortly thereafter (521 BC) he went mad and committed suicide during a revolt that had been provoked by his insanity. His death was followed by a period of confusion that nearly dissolved the new empire. A magus, Gaumata, asserted that he was Cambyses' brother and proclaimed himself king of Persia. The various provinces that had recently been annexed by Cyrus, Babylonia, Media, Armenia, and the others, revolted, each under its national king; but the Empire was saved by an Achae menid prince of a younger line, Darius I (Darayavaush). Darius was proclaimed king by the leaders of the Persian aristocracy after having successfully led them against the usurper Gaumata (521 BC), who was seized and killed, a triumph represented in relief and recorded in three languages on the famous rock of Bihistun. Thereafter Darius suppressed, one after another, the various provincial rebellions. The Empire was again welded together. Cyrus and Cambyses had been primarily conquerors, but Darius, while certainly not lacking in military prowess, was above all an administrator. He gave the Persian Empire its characteristic organization. 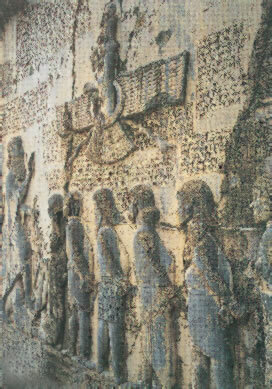 The 'Great Achaemenid Kings' were profoundly indebted to their Assyrian or Chaldaean predecessors. The Assyrian kings had, by their systematic annexation of Babylonia, Elam, Urartu, and Syria, fashioned a political unity in Hither Asia where the Chal daean civilization developed. 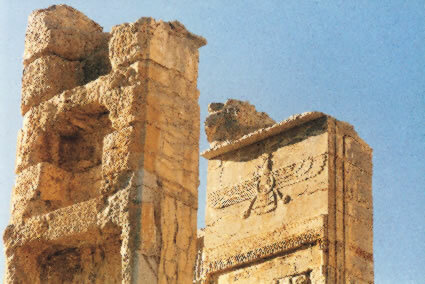 To this ancient structure the Achaemenids added their native Iran, as the Carolingians and later Franks joined their ancestral Germany to the bundle of old Gallic and Italian provinces. But this territory, vast and rich as it was, did not content them. Cyrus by 546 BC had pushed his frontiers to the Ionian cities on the coast of Asia Minor. He planned the conquest of Egypt, but his death intervened, so that it was left to his successor, Cambyses, to carry it out in 525 BC. The Achaemenids ruled the Valley of the Nile for over a century, borrowing from its ancient traditions ornamental motifs such as the lotus, techniques, and even lesser divinities like Bes whom they assimilated to their own mythology. Darius took Thrace, and Macedonia submitted to him. On the north Persian authority penetrated into Southern Russia and Transoxiana, receiving homage from such peoples as the Scythes, and on the east the imperial domains extended even to the Indus. 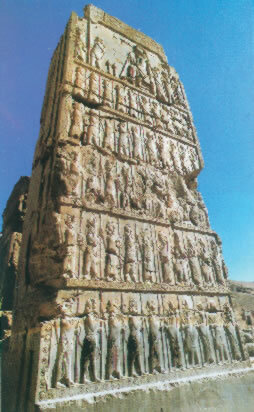 Many of the tributary groups are represented in the Persepolis reliefs. Moreover, the Achaemenids' accomplishment transcended the Assyrian by virtue of their greater capacity for organization and higher ethical conceptions. A strong central control was combined with full provision for permitting the various races within the Empire to maintain their national characters. The different civilizations already estab lished were allowed, with unfailing liberalism, to continue in existence, and the religions of the various subject peoples were also tolerated. While other Oriental conquerors, notably the Assyrians, had always fought with ruthless fury against strange gods, as against strange peoples, the Achaemenids never attempted to establish Ahura Mazda in place of the Semitic or Egyptian deities. Their rule shows no trace of the fanaticism which later, in the Sasanian period, created the great gap between Persia and the West. The attitude of the Jews to the Achaemenids is significant. Through their prophets as spokesmen they uttered only imprecations against their Egyptian, Assyrian, or Chaldaean conquerors, and later against their Seleucid or Roman governors, but they found in the Achaemenids masters after their own hearts. Cyrus became for them almost a national hero. The Old Testament always refers to him as 'the Lord's Anointed', and a Jewess, Esther, is represented as the queen of Ahasuerus. History renders an equally favorable verdict on the Achaemenids. Despots they were, like all other Oriental rulers, surround ing themselves with a halo of religious awe. They kept their subjects theoretically, at least, as slaves, and there were among them eccentric, violent, and weak rulers. But these personal peculiarities were exceptional and had almost no repercussion in the administra tion of the vast empire. The Achaemenid peace, similar to the later Roman peace, was established throughout the orient for nearly two centuries. The hostilities which had been the almost unremitting curse of the East suddenly ceased, and the Achaemenids profi ted by the opportunity to support civil progress in many ways. In place of the sudden, random exactions of tribute which the Assyrians had imposed on their conquered peoples, the Achaemenids introduced systematic taxation, paid partly in kind according to the products of each district. A network of great roads was kept in careful repair. These were guarded by troops and provided at proper intervals with splendid hostelries, and there was a per manent organization of royal messengers. Agriculture was protected; royal game pre serves were established; justice was systematically and well administered; under Darius money was, for the fi rst time, in general circulation; and at Persepolis and Susa magnificent capitals were created. A great injustice is done the Persians when they are regarded only as the protagonists of 'barbarism' against the Greeks. Actually these so-called barbarians were worthy representatives of Aryanism in the midst of the Oriental world. Politically, ethically, and culturally they maintained a standard which compares favorably with that of their prime opponents, the Greeks. They were the fi rst people of antiquity to show them selves capable of organizing a great empire that would last, an accomplishment in which the Greeks, for all their brilliant qualities, never succeeded. As administrators they were unmatched in the ancient world save by the Romans. Other races had for centuries succeeded only in perpetuating dissension, hate, and violence in the Near East, but the Achaemenids gave the whole region a unifi ed, orderly, and in general peaceful and benefi cent government. Achaemenid Persia was, moreover, highly evolved cultur ally. The Greeks themselves marveled at the luxury of the Achaemenid court, and even the scanty remains that we have of the decorative arts show that the Persians achieved in this period, not merely the ostentation which had long been the pride of royalty in the East, but also a sophisticated and fi nished elegance, while their architecture and especially their sculpture touched one of the high levels in the history of these arts for all times. The career of the Achaemenids after Darius is closely connected with Greece. The Persians suffered defeat at the hands of the Greeks by sea (Salamis, 480 BC) and by land (Plataea, 479 BC), but in spite of these setbacks they continued to play a considerable part diplomatically in Greek affairs throughout the fi fth and the fi rst half of the fourth centuries BC. The Peloponnesian War was about to begin and the Great King was called in by the Greeks themselves to serve as arbitrator in their disputes, a service for which Artaxerxes I (Artakhshathra, 464-424 BC) had already been approached. During the reign of Artaxerxes II (405-358 BC) Persia lost heavily in Asia Minor, but she regained by diplomacy part of that which she had lost, and the prestige of the Achaemenids was already somewhat restored, when a great and energetic king, Artaxerxes III Ochus (358-337 BC), seemed to revive the full glory of his line. But the Macedonian invasion was about to begin.